My new issue of The Rake arrived in the mailbox on Saturday and, as usual, it is up to snuff. I spent a lot of time with the new issue yesterday and am looking forward to more today. I would have never thought of pushing some colour into a very conservative suit like the one in the photo above. I tend to reserve colourful accents for dark blue suits and navy blazers for some reason. But in the spirit of adventure, and with an eye on the editorial I gave it a shot. Here, I’ve enlivened a stalwart grey (with tan stripe) Oxxford suit adding a lavender striped shirt, a lavender, navy, white and brown striped tie and a brown, orange, navy and purple patterned pocket square. If it seems a bit much, it is. The square itself would make a fine counterpoint for a solid or discreetly patterned dark tie and more “sober” shirt. But that wasn’t the point this time. This entry was posted in Elegantology and tagged Oxxford, The Rake. Bookmark the permalink. Very cool….an interesting ensemble…love the color accents used. Bravo! A peacock with the splendid plumage is after all, the male. Your observation about color, and how to integrate it into any palate, is the reason why, I would argue, Paul Stuart has been successful for so long – whoever dictates their “looks” does a wonderful job integrating colors into the most somber of ensemble. Thank you Karena. It was a bit shocking to try and I’m glad I did. Mrs. PvE! Thank you very, very much. Ex-Banker Jon, Thank you. It is a strange thing to try and pull off for me. It requires looking at things in a different light. I’ll pop over to PS.com to see how it’s done. Thanks for the inspiration! Very nice look! I especially like how the tie and pocket square don’t match 😉 Even so, the outfit comes together nicely. I think it would work equally well with a blue shirt. There are those who hold that the best pocket square is one that has no connection with the rest of the outfit yet does not clash. As an example, yesterday I wore a blue & white university stripe button down Oxford shirt, a red plaid tie, blue trousers, gray with blue tweed jacket, and burgundy belt & shoes. 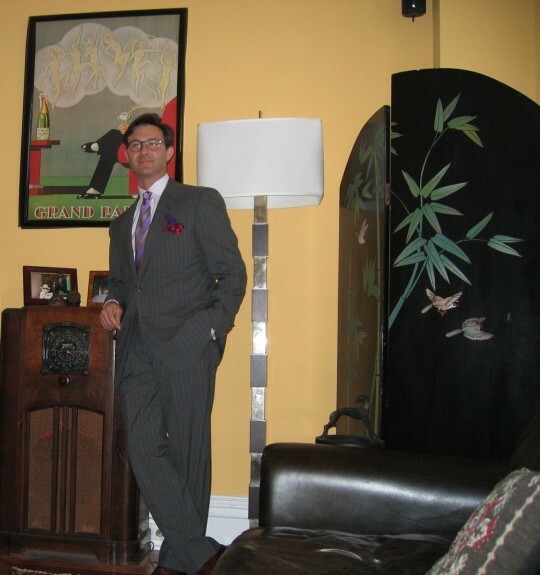 To top it all off, I added an unpatterned purple silk pocket square. Not completely out there, as purple, burgundy, and red all fall within the same range of the color wheel, but there was only one purple element. I’d like to think it worked. Really out there would have been green, or orange, or yellow–all colors lacking in my pocket square collection. P.S. : What color are your shoes? Hi Brent, darkest brown shoes. Your look, your ensemble, your stance — easy, elegant, exquisite!